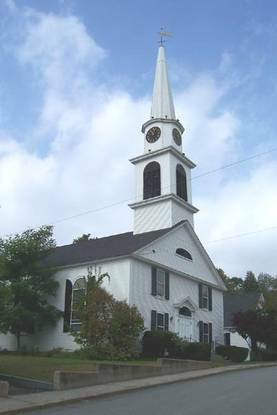 The sanctuary of the church was originally constructed in 1832 and moved to its present location in 1842. The square tower was removed in 1871 and replaced by the spire. We celebrated our 200th anniversary in 2015. Not visible in the photograph are the office wing and the Fellowship Hall. Sacrament of Communion is offered the first Sunday of each month. service on dates as noted on the Activities page. Childcare available during the worship service. devices for hearing impaired are all available. We invite you to come and experience the warmth of worship with us!